Many times over the past years I’ve marvelled at how much life has changed since coming to Casalinho. Sitting at my office desk ten years ago, the idea of pulling on the rubber gloves and sticking my hand up a goat to assist her giving birth would have been pretty alien, but that’s what I found myself doing on Sunday afternoon! This year we have had all six of our lady goats pregnant. The first kid arrived safely on Friday. Little Horny (original name, I know, but just wait ….) managed to kid without any of us realising, and the first we knew was the kid making a hell of a racket objecting to mummy goat washing him down. He sounded just like a peacock! Little Horny had managed to fool us into thinking she wasn’t pregnant until very recently, and one of our goat expert neighbours too. Handsome little chap, isn’t he? Kid number two arrived on Sunday, but it wasn’t quite so simple. We were alerted by mummy goat making a lot of noise, so I went out to check on her and the kid was partially birthed but stuck and the mother was in distress. The baby had one foot up and out, and one tucked away out of sight somewhere. Normally the feet come out alongside the head so this was a potential problem. I waited a short while to see if anything happened, really hoping that mum would manage on her own as intervention can be counter-productive if unnecessary, but there was no movement at all and the kid appeared to be very weak. Previously our goats have always birthed with no problems so I’ve never had to get involved in any way other than to watch. Jeroen went off to find a local goat expert whilst I kept an eye. Still nothing happened, and mummy was getting more and more distressed so I decided that it was time to try and help, even without an expert to hand. One of our volunteers found me a pair of surgical gloves in his van and I delved in, so to speak. This mummy goat was Mini Horny (really good with goat names, aren’t we?! ), a first time mother and still young. Even with my small hands I could not insert my fingers far enough to locate the second leg despite trying and trying. So I very gently pulled the first leg out slightly, which allowed a little more space. I was then able to get my hand under the kid’s chest and with some gentle pulling the first half of the kid came out. It was barely moving and although I really hoped that the mother would then take over and continue the process, she must have been exhausted because she didn’t even try. 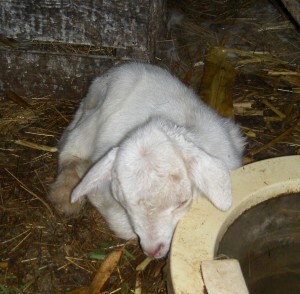 I gently birthed the back end of the little kid as well, and laid it on some straw next to Mummy goat’s head. Thank heavens it was still alive, though very weak. Mini Horny was not at all interested so I cleaned up baby’s face to ensure it could breath properly. She still was not interested so I had a stroke of genius and let her own mother (Little Horny) back into the shed. Little Horny sniffed about and quickly sussed out what was going on, then gave the new mother a swift headbutt. New Mum started licking her baby and I took the older goat away again. It was the most amazing thing to see! At this point Jeroen got back with our neighbour, and I was so proud to be able to present a live mother and a live baby! Apparently I’d done the right thing, as our neighbour said it probably wouldn’t have survived otherwise. It took a lot of encouragement for the baby to suckle, but at nightfall it was still alive and it was on it’s feet. Today, it’s third day, it’s a lot stronger and I feel it’s out of danger. It’s still weaker than I’d have hoped, but I’m sure it’ll be catching up and creating merry hell with it’s older cousin in no time. Amazing what you can do when you’ve got no choice! 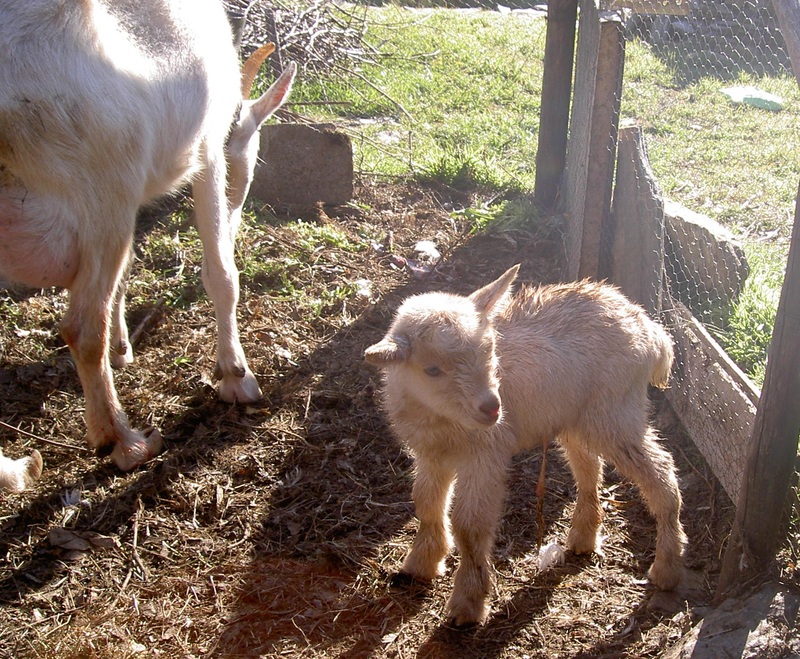 Well done … I hope he continues to get stronger and the rest of the goat mummies give birth without any problems. Well done. Goat family interaction never fails to amaze me. Mummy’s boss daughters and aunts babysit for each other. It’s astounding. Until this recent round of pregnancies our ladies have never shown any family bonding whatsoever. It’s only these last few weeks that the three older mums to be have paired up with the three younger ones (whom I’m presuming are their daughters, I sort of lost track of who belonged to who last time). With two of the four still to kid being younger ones, I’m planning on keeping them paired like this for the time being. What new Mum doesn’t want her own Mum about after all? Wow, this post really made my morning. (: Now I have a feeling this is going to be a good day, especially because the sun finally came out after several weeks! Thanks for the story, and by the way you’re awesome.